Town twinning, or city partnering, is designed to bring people together. The university towns of Tübingen and County Durham have been doing this since 1969, promoting cultural exchanges by offering financial and organisational support. Initially, the focus was on pupil exchange programmes and musical collaborations. In 1986, Keith Armstrong and Durham County Council opened a new door by suggesting writer’s exchange. This door became a swing door that has been swinging back and forth since 1987. Over the past thirty years, Keith Armstrong has been committed to ensuring that the door continues to swing in both directions. He took the first step by performing his poems in Tübingen to provide a view of the landscape and the people of its partner county in Northern England; a coal mining area experiencing a time of change, and of Britain's role in the world. What do guests from County Durham find in Tübingen? : a mecca for literature enthusiasts: old and new authors who share a connection with the city; the Tübingen Book Festival, students from across the globe, a poetics lecture series at the university, literary museums (Sara Hauser who was born in 1986 and who read her own work in Durham in 2014, organises literary evenings with young poets in the Hesse Cabinet), a public library in the town centre, a creative writing scene, students at the Literature and Theatre Studio who publish alternative online literature magazines, and the newly established writers’ collective, the ‘Dichterkammer’ (Chamber of poets), which is open to all and was founded and developed by several of the authors featured in the recent anthology 'Word Sharing'. A trip to Durham with the opportunity to present their own texts became an attractive prospect for them. The authors from Tübingen have discovered that County Durham offers many writers' workshops and publication opportunities, even for unknown authors. Keith Armstrong provided ever new venues for the guests from Tübingen: at schools throughout the county, in the main Durham library, at Durham and Newcastle Universities and, of course, also in pubs. 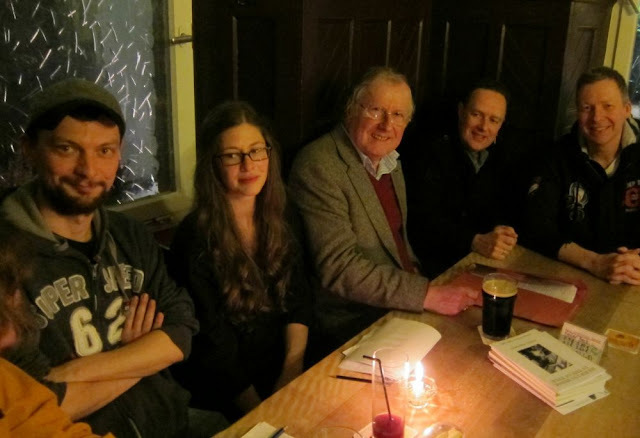 Most of the authors from Durham are globetrotters who are open to experiencing Tübingen – just like their counterparts from Tübingen who are seeking to explore County Durham. 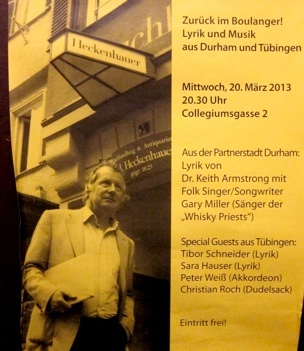 Keith Armstrong has documented his particular love for Tübingen and his interest in the city’s poets, philosophers, streets, squares, buildings and history in numerous poems, some published in 2007 in his book “Hermann Hesse in the Gutter”. Armstrong also impresses with his performances – speaking rhythmically, almost song-like, in a standing position – winning over audiences, be it in a pub or on a poetic walk through places in the city that are featured in his work, often accompanied by a musician from County Durham, such as guitarist Gary Miller, or his friend, accordionist Peter Weiss from Tübingen. The individual performance skills of his English colleagues are every bit as developed as his own. We hope there will be further word sharing opportunities that can overcome any borders.